At CES earlier this year, M.2 and PCIe was definitely among the major talking points for SSD technology. 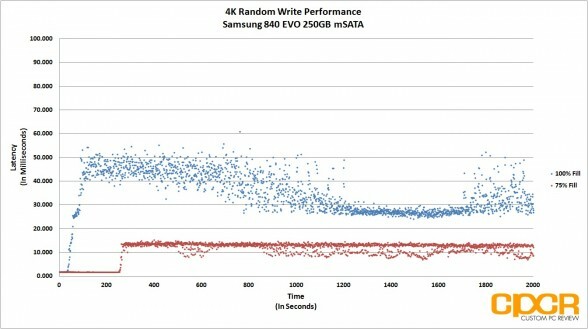 Every SSD manufacturer had something to say and almost everyone had something to show as well. 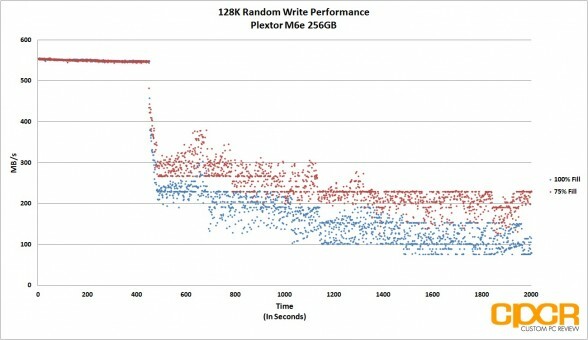 A couple weeks ago we received the rare opportunity to review the Plextor M6e 256GB M.2 PCIe SSD and was very impressed with what it had to offer. 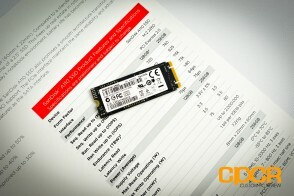 This week, we received an even rarer opportunity to review the SanDisk A110 256GB M.2 PCIe SSD. 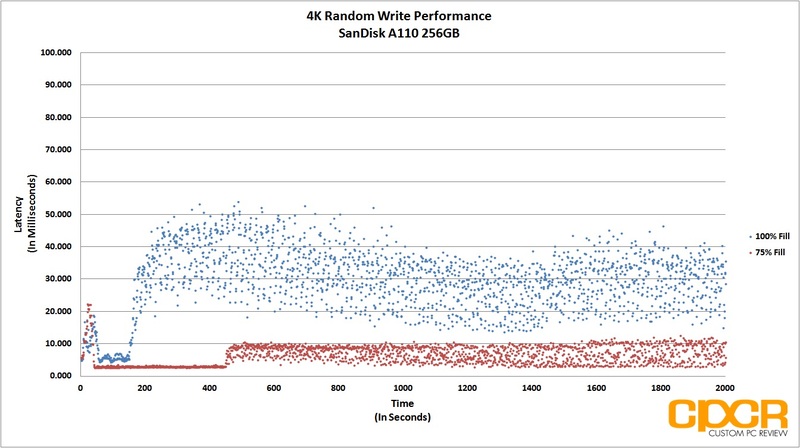 Now the SanDisk A110 is really one of SanDisk’s first entries into the M.2 PCIe SSD space although it’ll be only available to OEMs at this time. SanDisk has not indicated that it’ll be available for the consumer market although I’m sure some iteration of the drive will be available later on when M.2 PCIe becomes more mainstream. As far as specifications go, the SanDisk A110 looks very good on paper. 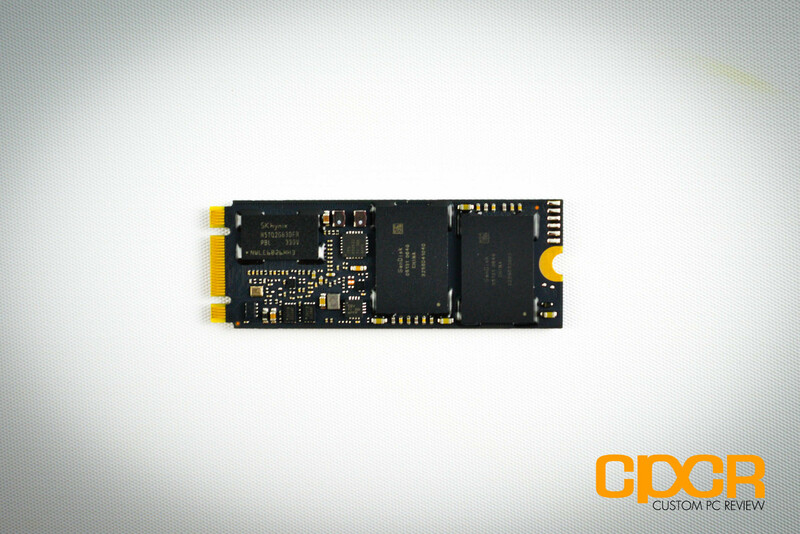 The drive is based on the M.2 2260 form factor, which means it’ll be a 22mm wide by 60mm long drive using a 20mm wide M.2 edge connector. 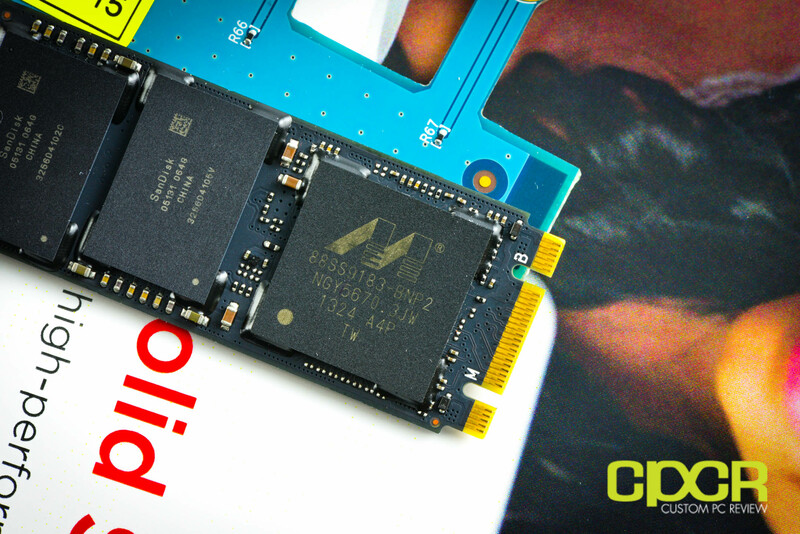 The drive is wired for PCIe 2.0 x2, so it’ll only be compatible with M.2 slots wired for PCIe. 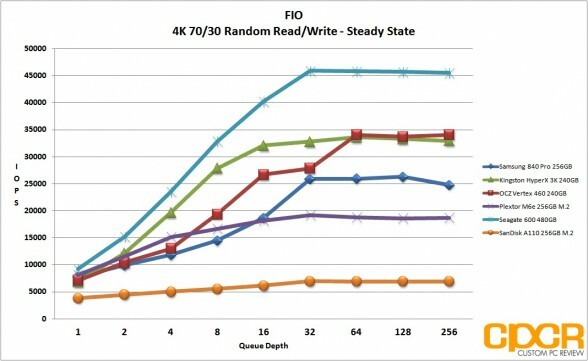 Being wired for PCIe, it’ll also be capable of performance up to 740MB/s sequential reads and 625MB/s sequential writes, which is faster than what’s capable on SATA 6Gb/s. 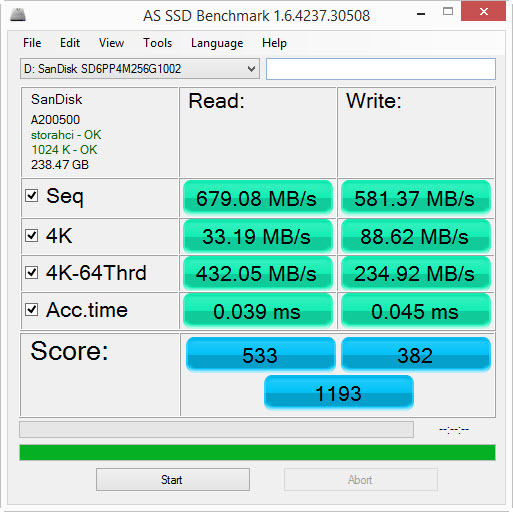 The SanDisk A110 also uses the latest Marvell 88SS9183 SSD controller paired with their own exclusive SanDisk 19nm eX2 ABL Toggle Mode MLC. The drive will come in capacities of only 128GB and 256GB which is likely due to size constraints of using the M.2 2260 form factor rather than the longer M.2 2280 (or beyond) form factor. As usual, the firmware is built in house by SanDisk’s in-house firmware team. 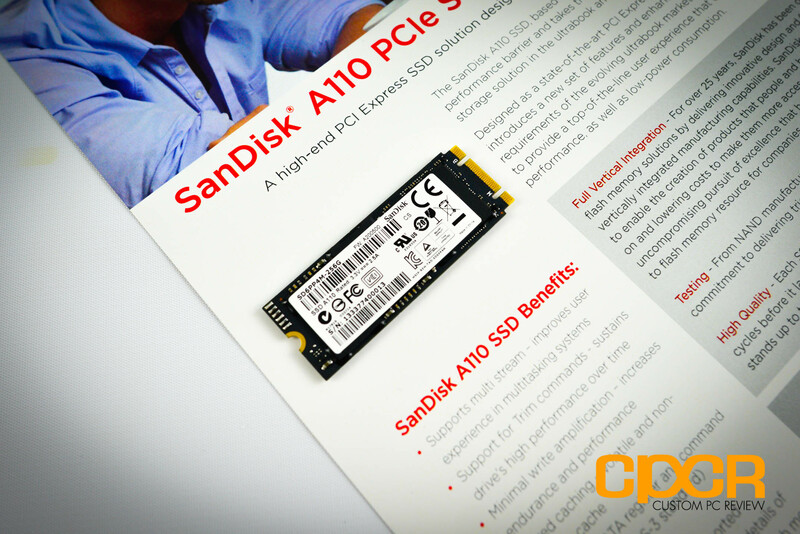 Since the SanDisk A110 is an OEM product, we simply received the drive in a black box along with some marketing materials and a fancy M.2 to PCIe x4 adapter. 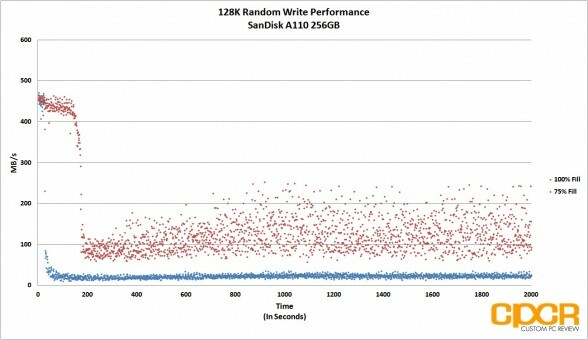 Here’s a look at the SanDisk A110 256GB. 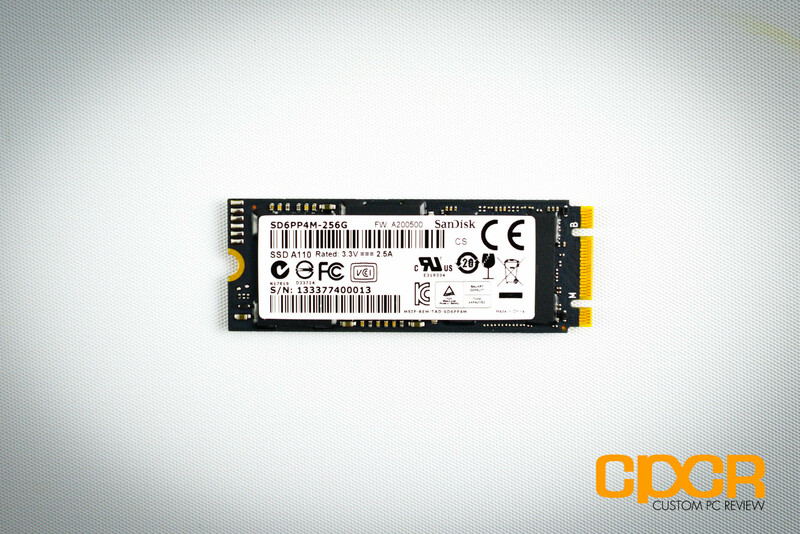 It’s a M.2 2260 form factor drive so it’s 22mm wide and 60mm in length. 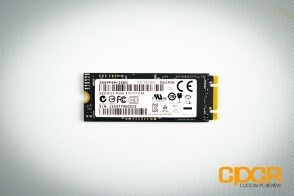 The edge connector is 20mm wide and has 2 notches which signifies that it’s using a B and M edge connector design. Unfortunately, there are some B connector M.2 designs that are wired for SATA only, so the drive may not work in some systems even if it will fit. 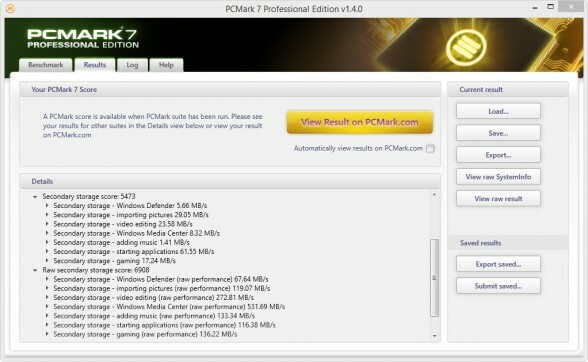 Here’s a look at the fancy adapter we received. 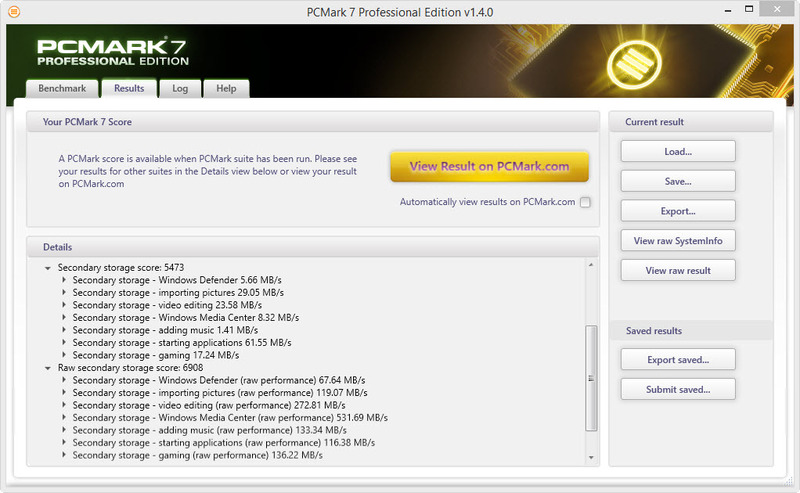 The adapter is pretty cool in that it has a number of debugging options as well as the capability of using external power. Unfortunately external power gets stepped down from 5v to 3.3v using a resistor rather than a direct 3.3v line, so it’s impossible to accurately measure power consumption. 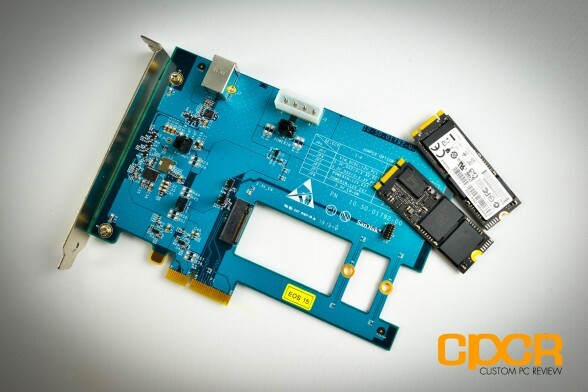 Taking a closer look at the controller here, SanDisk is using the Marvell 88SS9183-BNP2 controller, which is the same controller seen on our very recently reviewed Plextor M6e 256GB M.2 PCIe SSD. 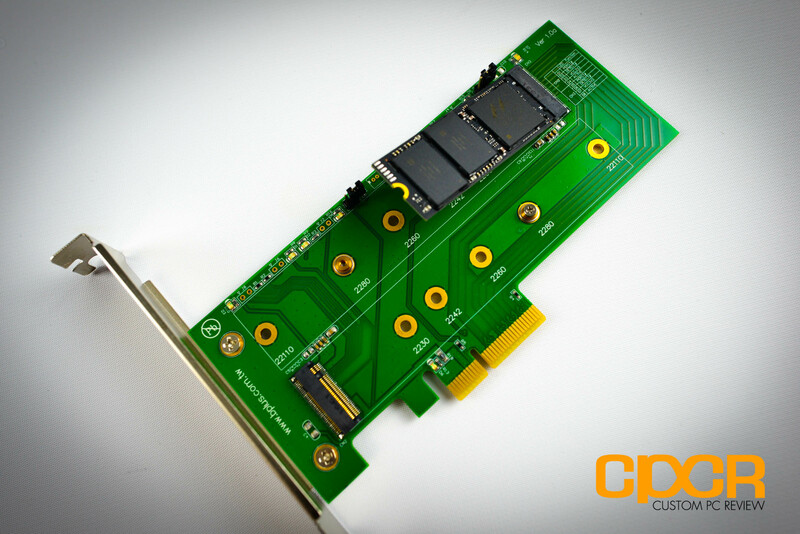 The controller is one of Marvell’s latest native PCIe 2.0 x2 SSD controllers with a theoretical maximum of up to 1GB/s. 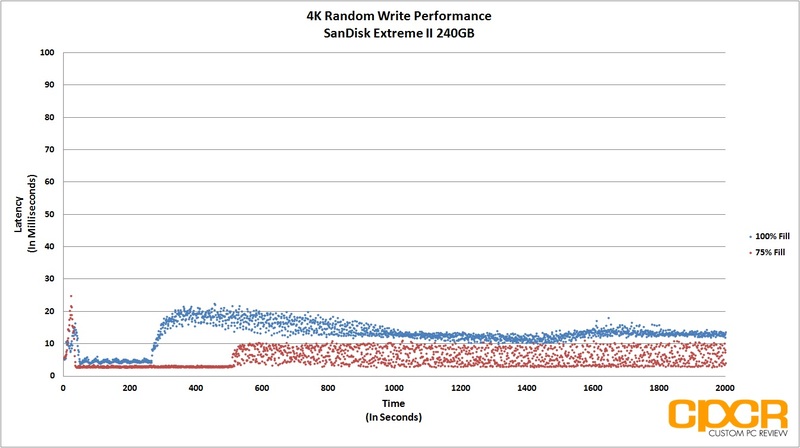 Because SanDisk jointly owns of one of the largest NAND foundries in the world, the SanDisk A110 256GB uses four packages of SanDisk’s very own 05131 064G eX2 ABL 19nm Toggle Mode MLC NAND. 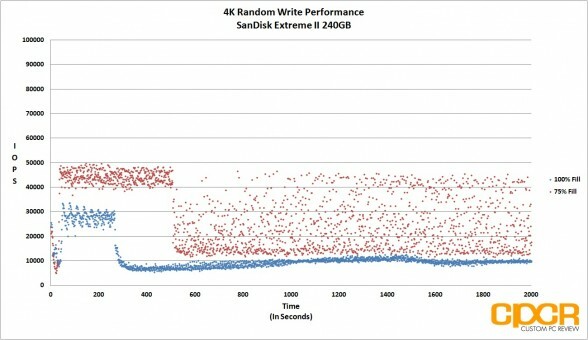 The SanDisk’s 19nm eX2 ABL 19nm Toggle Mode MLC NAND is proprietary SanDisk NAND which features SanDisk’s nCache technology which we’ve covered previously on our review of the SanDisk Extreme II. 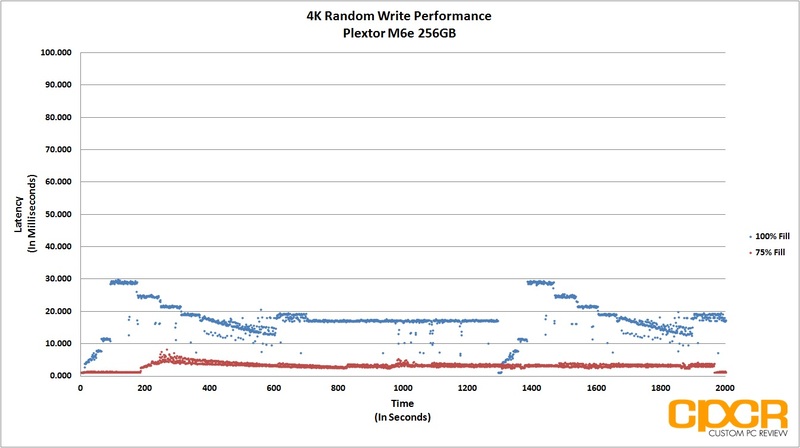 For the DRAM buffer, we get a single 256MB of SK Hynix DDR3-1333MHz. 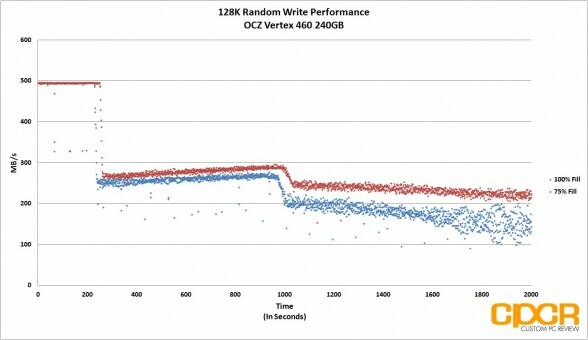 This gives the SanDisk A110 256GB a good 1MB DRAM buffer per GB of total capacity. Today we’ll be reviewing the SanDisk A110 256GB M.2 PCIe SSD containing firmware A200500. 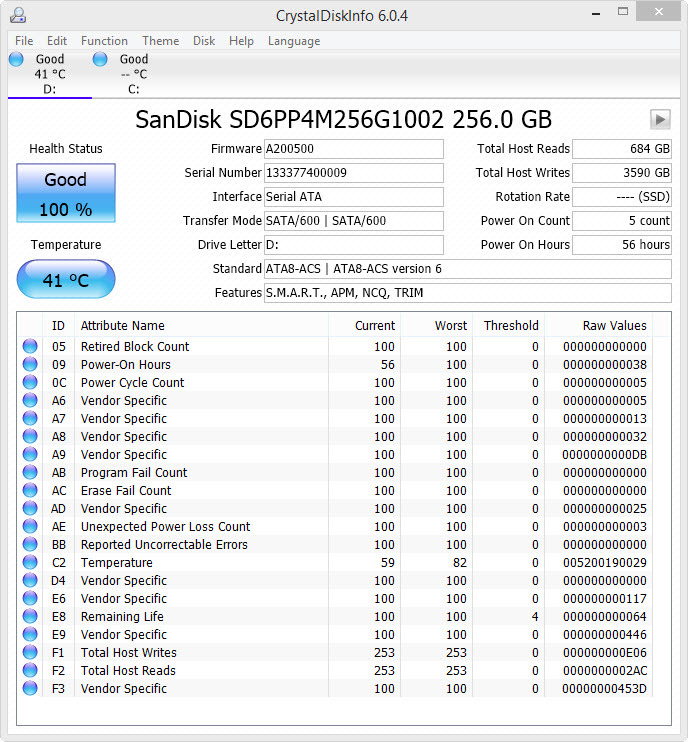 Our sample of the SanDisk A110 contains numerous basic features such as S.M.A.R.T. monitoring, NCQ, TRIM, and APM; however, since the SanDisk A110 is a product designed for the OEM market, additional features such as DevSleep for example can be implemented for system integrators to better fit their products needs. Although SanDisk sent us their very own special M.2 to PCIe x4 adapter, firmware is built into the SanDisk A110 to leverage the AHCI protocol which allows the A110 to be used out of the box with any M.2 to PCIe adapter. 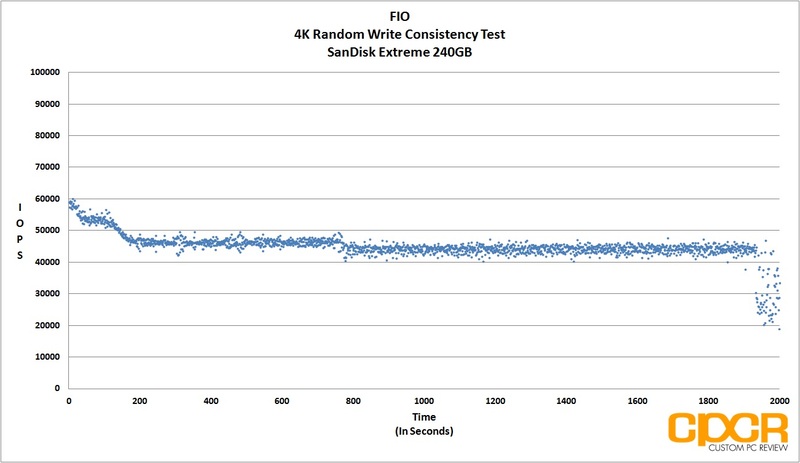 The SanDisk A110 256GB M.2 PCIe is rated at 740MB/s sequential reads and 625MB/s sequential writes. 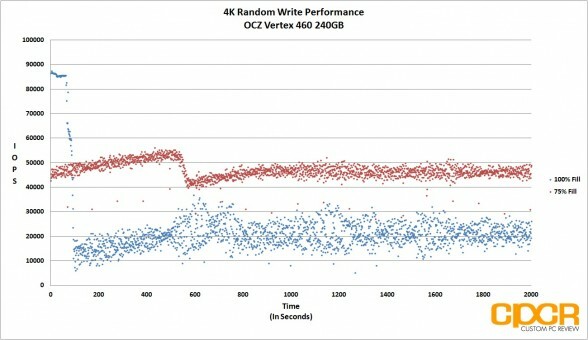 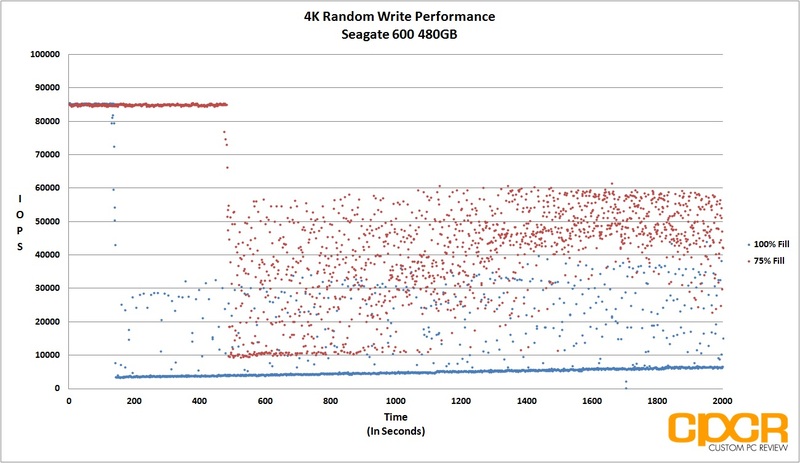 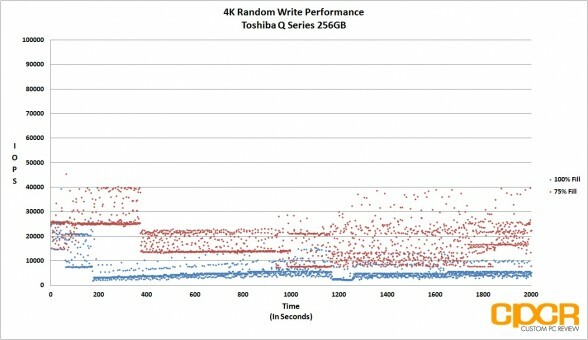 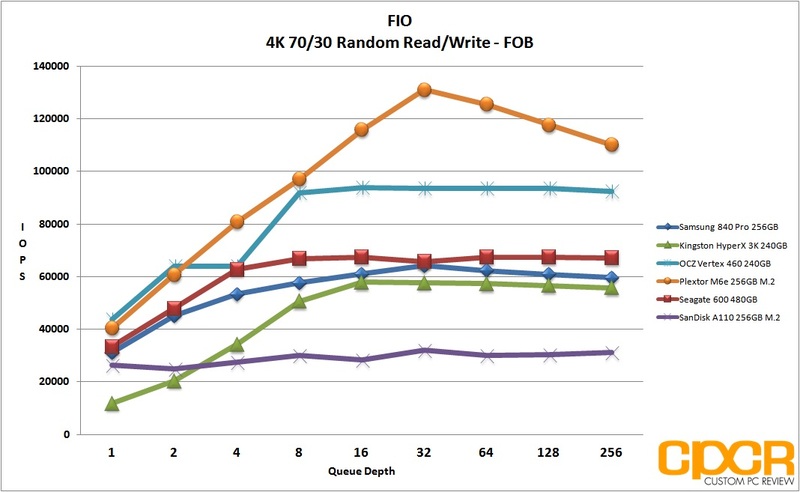 These figures are actually slightly conservative as our testing in ATTO Disk Benchmark shows that we’re able to reach speeds of up to 774MB/s sequential reads and 627MB/s sequential writes. 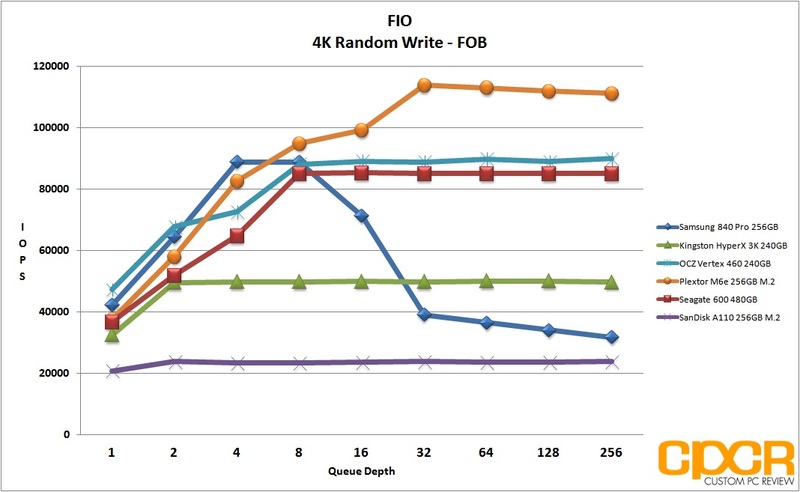 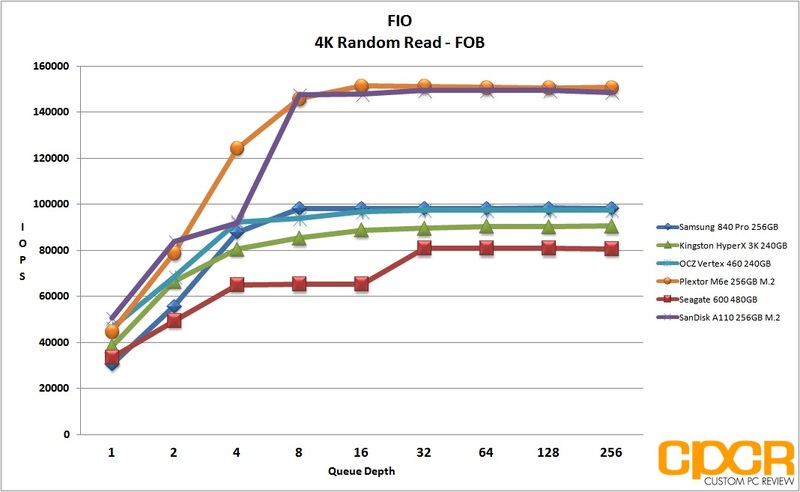 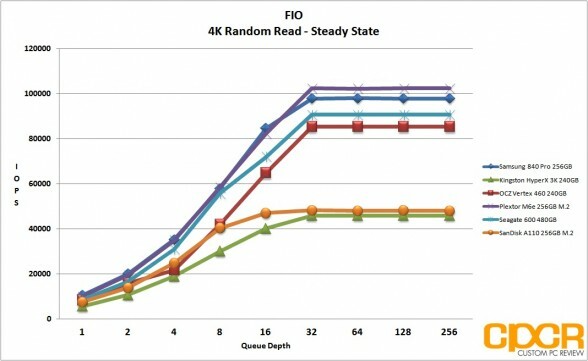 Although lower queue depths evens the playing field between SATA and PCIe SSDs, the SanDisk A110 still shows its dominance, especially in sequential reads of up to 679MB/s. 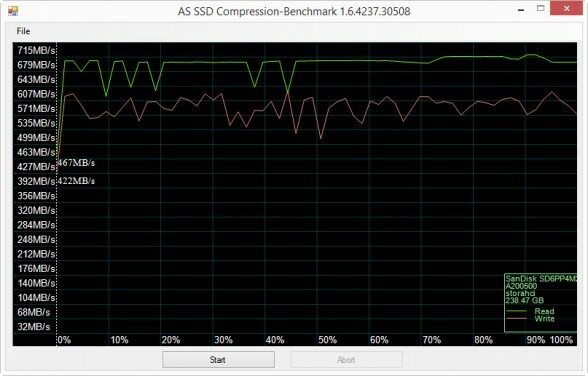 One thing I found interesting while testing the A110 is that compression seems to affect its performance, but only when the data is very close to 100% incompressible. Again, Crystal Disk Mark at QD 4 confirms our findings in our previous tests. 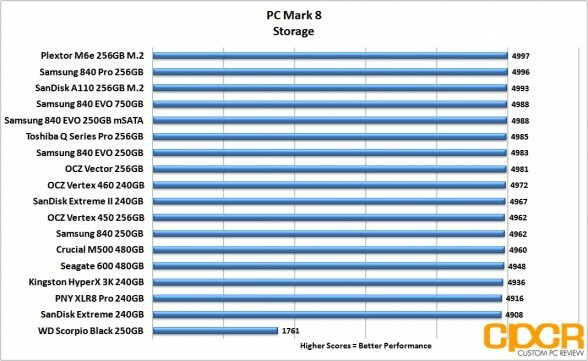 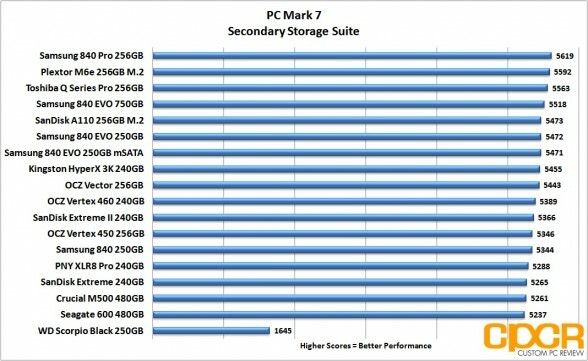 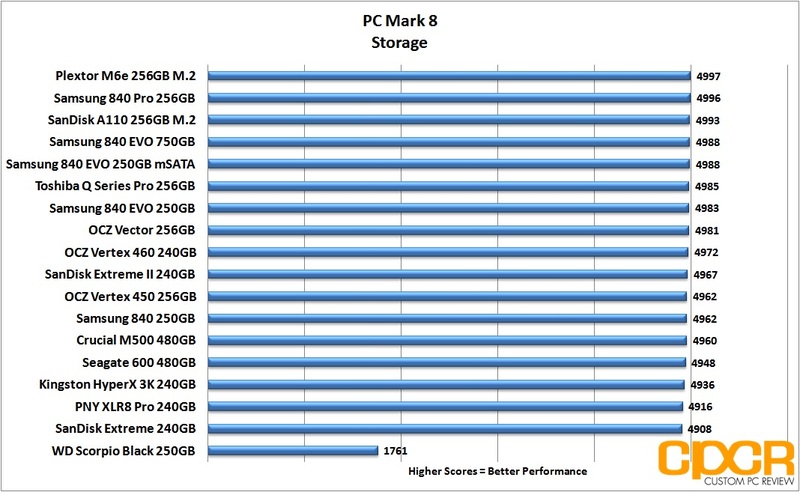 In PC Mark 7/PC Mark 8, the SanDisk A110 256GB tops the charts as one of the fastest SSDs we’ve ever tested. While it’s still behind the Samsung 840 Pro SATA SSD in our testing here, that’s mainly due to the fact that PC Mark is very consumer oriented and tests focus on low queue depth operations rather than single large file transfers where the A110 has its major advantage. 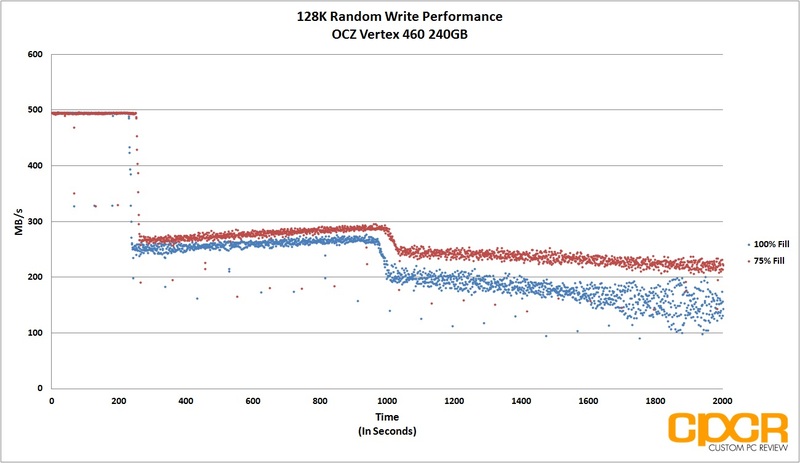 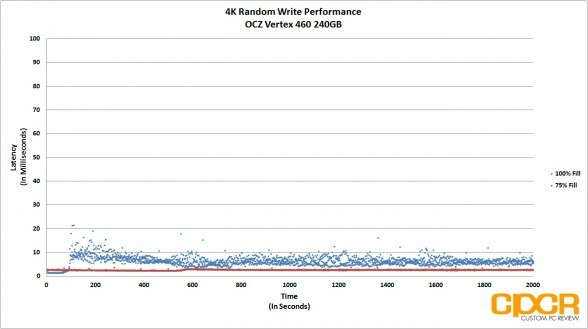 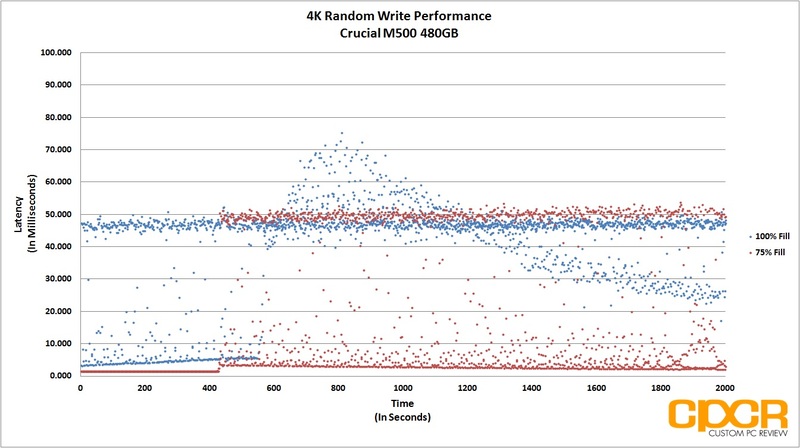 Since SanDisk advertises the drive at 73K random write IOPS, I was a bit confused at why my 4K random write results were far lower than what SanDisk advertises their SSD at. 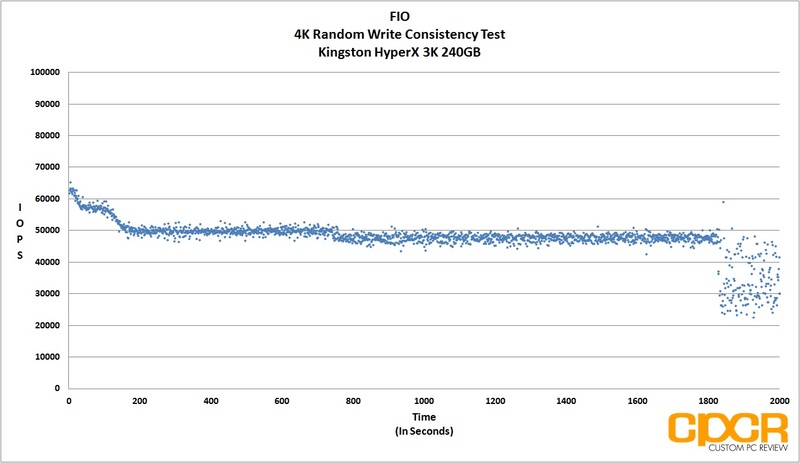 After a bit of tinkering, I realized that the A110 actually discriminates performance based on 100% random or 100% sequential data. 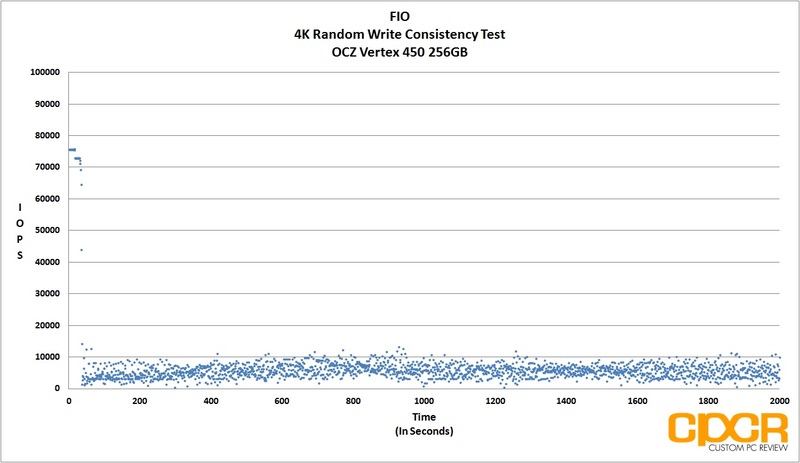 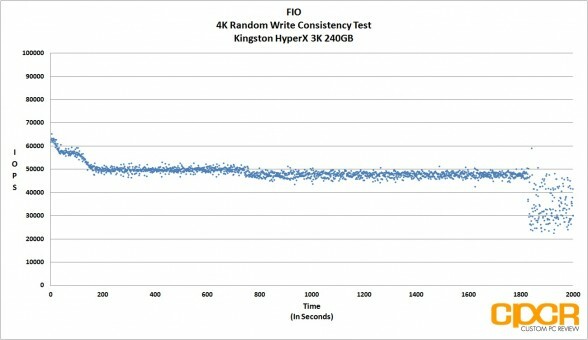 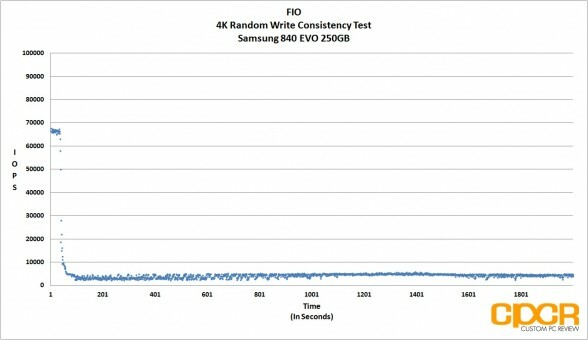 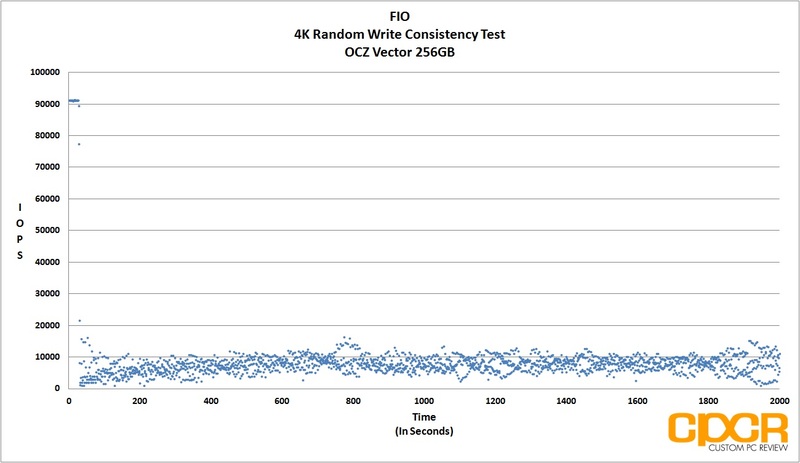 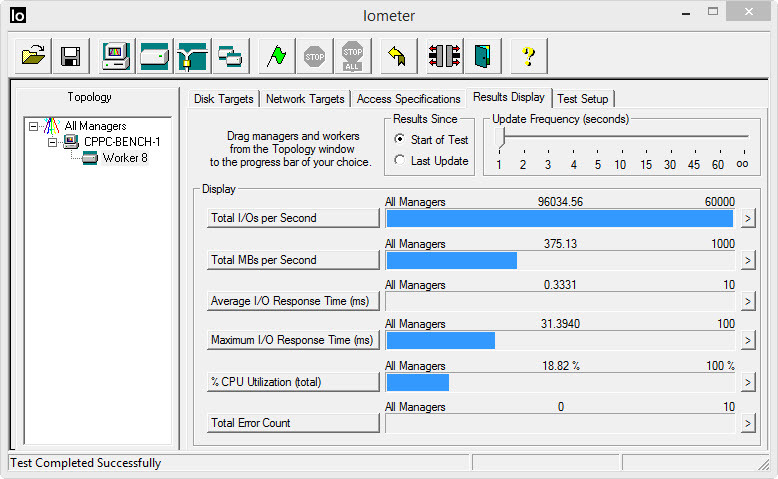 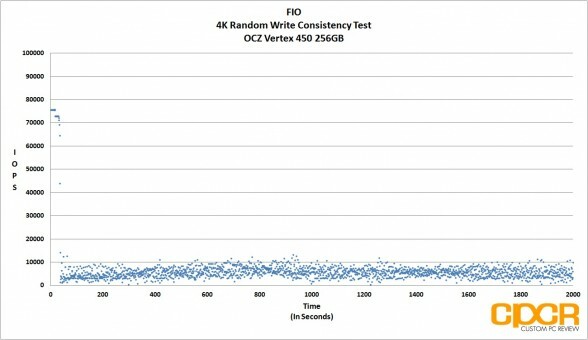 As you can see in our IOMeter testing above, the A110 is actually capable of up to 96,000 IOPS 4k writes when tested with 100% compressible data – a huge difference in comparison to the 23,000 IOPS achieved in our 4K random write testing earlier. The SanDisk A110 is very much a consumer oriented drive and doesn’t seem to enjoy being in steady state at all. 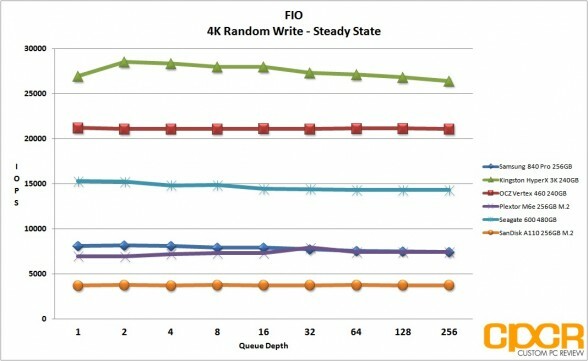 In our 4K random read testing, the drive topped out at 45,000 IOPS and in 4K random write testing, it topped out at a paltry 7,000 IOPS. 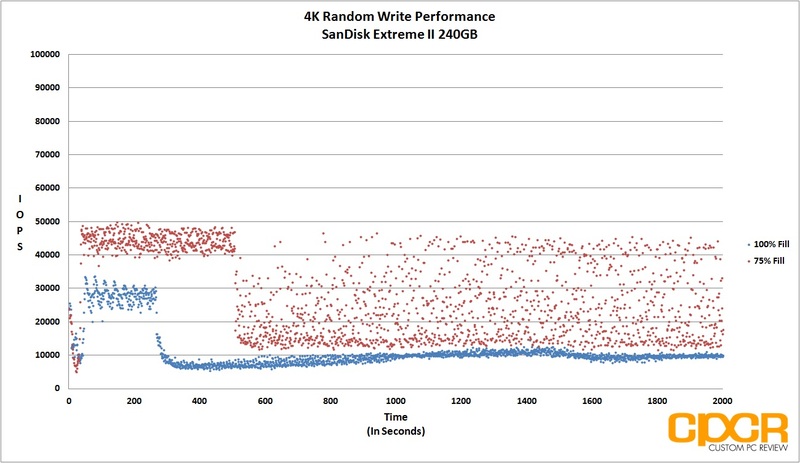 I think a big part of this is due to the fact that SanDisk isn’t over-provisioning the A110 at all unlike the similar SanDisk Extreme II reviewed previously. 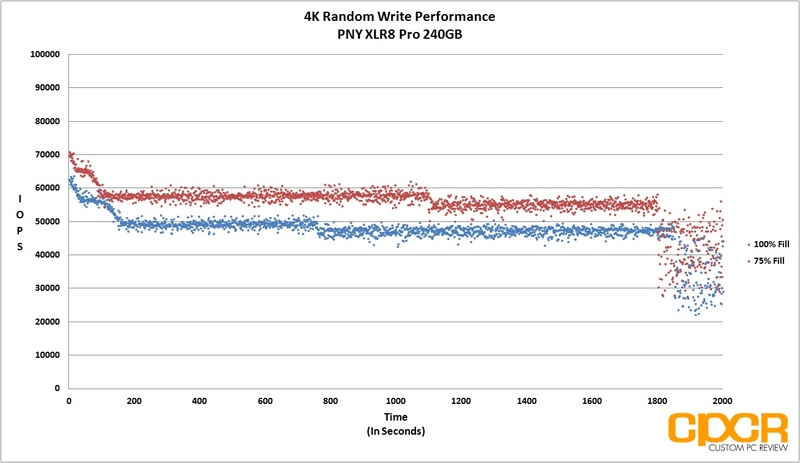 4K write performance consistency is very interesting as it clearly shows how similar the SanDisk A110 is in comparison to its brother, the SanDisk Extreme II. 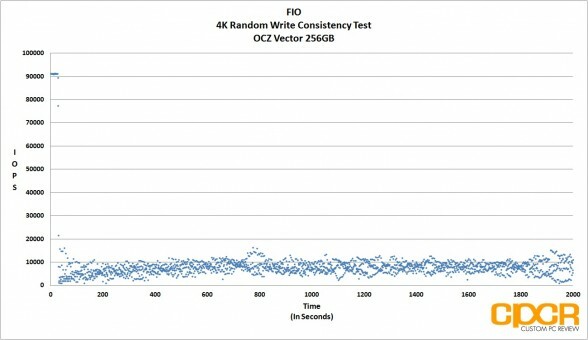 Consistency at 100% fill is actually decent; however, performance tends to jump all over the place at 75% fill. 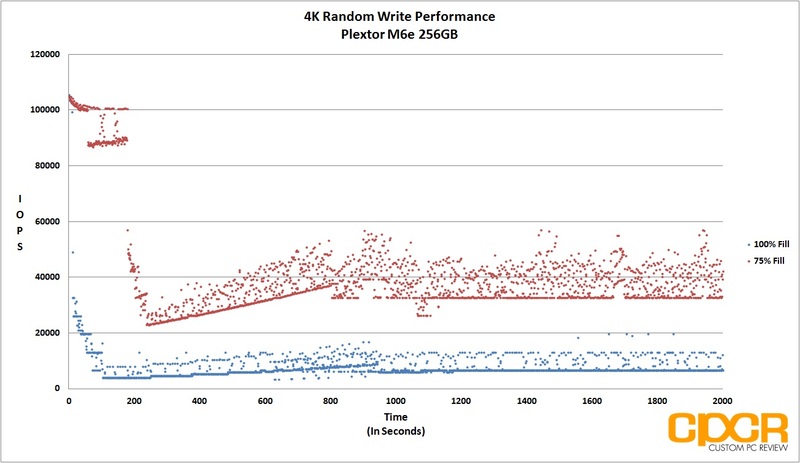 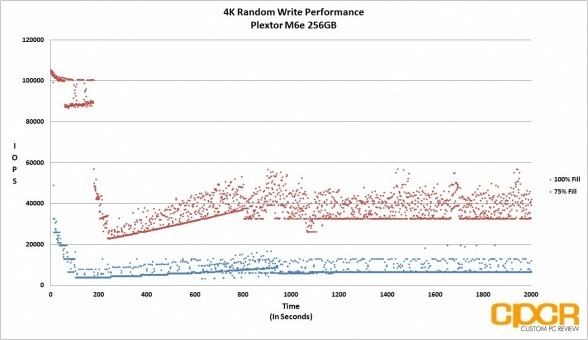 There’s definitely room for improvement considering Plextor’s M6e is able to offer much better performance consistency using the same controller. 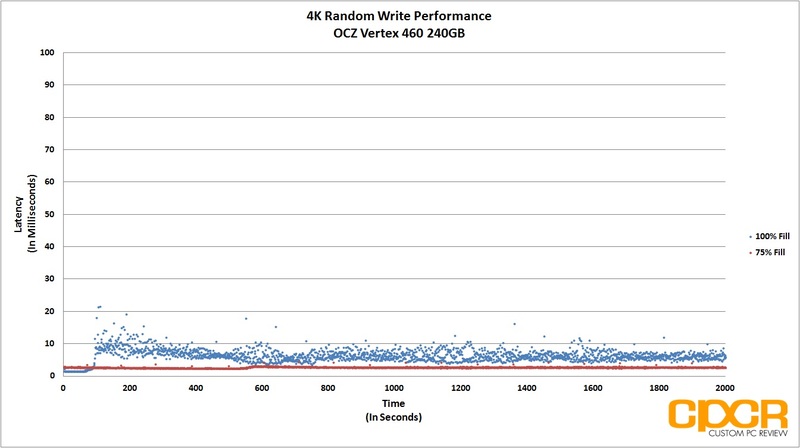 Latency is decent here with latency hopping above 50ms only a couple times when the drive is at 100% fill. 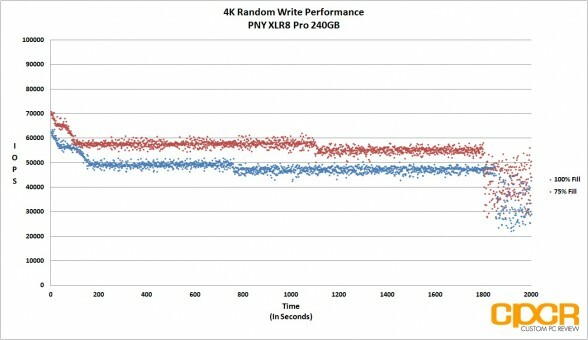 However, I can’t help but feel like the A110 is taking a step back from the Extreme II which has far superior performance here. I think the A110 would benefit greatly from some over-provisioning. 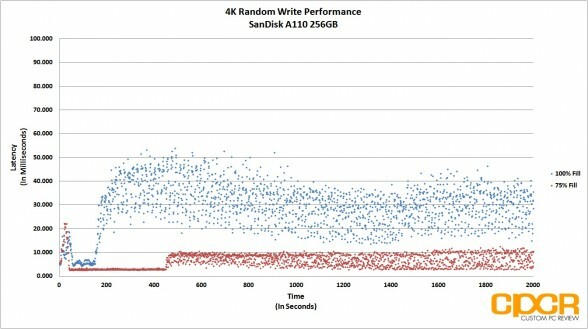 The SanDisk A110 is a consumer oriented SSD designed for read intensive use cases, so it didn’t fare too, too well here. 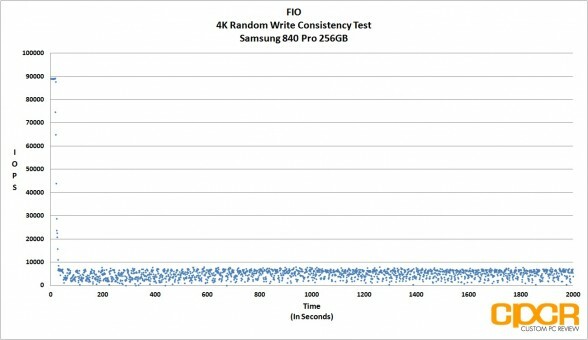 Performance at 100% is surprisingly consistent however although total performance isn’t very high after the drive hits 100% fill. 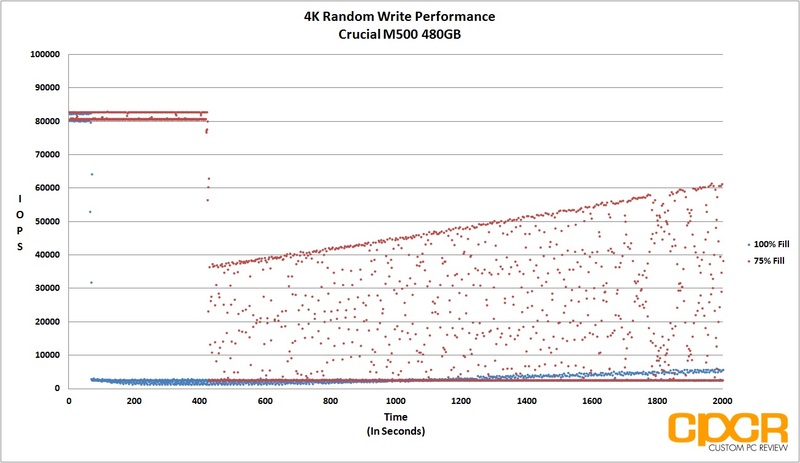 After receiving the opportunity to play with the Plextor M6e 256GB M.2 PCIe SSD a couple weeks back and now the SanDisk A110, I’d have to say that I’m very excited for what M.2 and PCIe SSDs have in store for us this year. 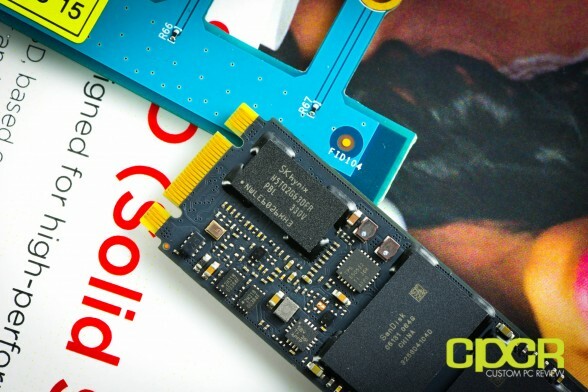 With PCIe SSDs gaining as much traction as it is, it shouldn’t be long before we see PCIe SSDs rolling into the mainstream market. In testing, the SanDisk A110 256GB was pretty much what we’d expected. 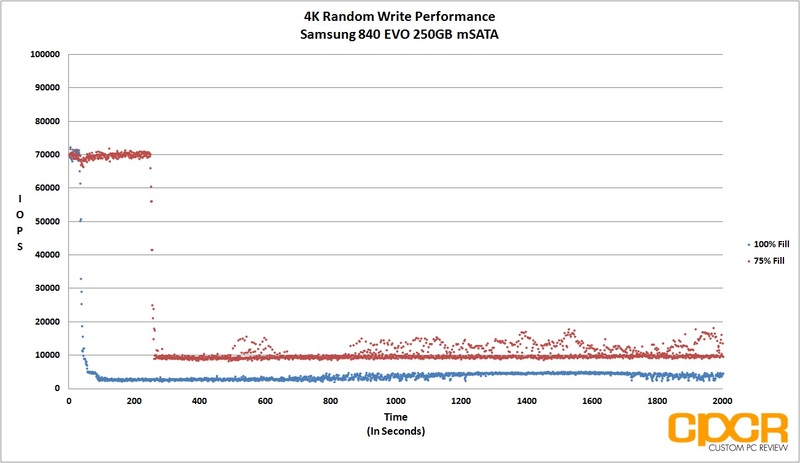 In certain scenarios, the A110 was capable of exceeding the performance limits set by SATA 6Gb/s, but given the nature of consumer use, it’s likely that the A110 won’t be much faster than most enthusiast SATA based SSDs on the market. Most consumer use focuses on small file, low queue depth operations and without transitioning from the old AHCI storage protocol to NVMe, we probably won’t have PCIe SSDs performing leaps and bounds faster than what we can find on SATA based consumer SSDs of today. 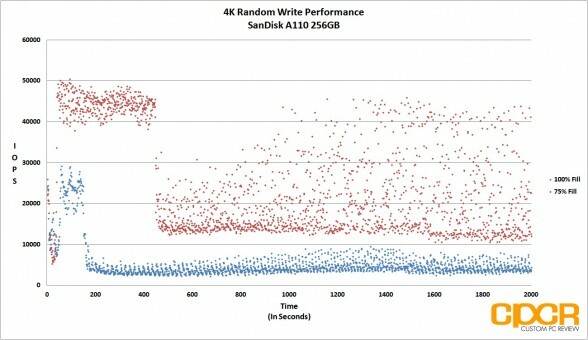 Pricing information on the SanDisk A110 is unknown and you probably won’t be able to get your hands on a drive either. The SanDisk A110 is an OEM only product designed for system integrators at this time. 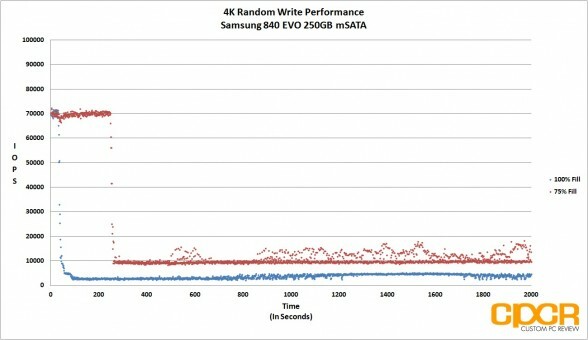 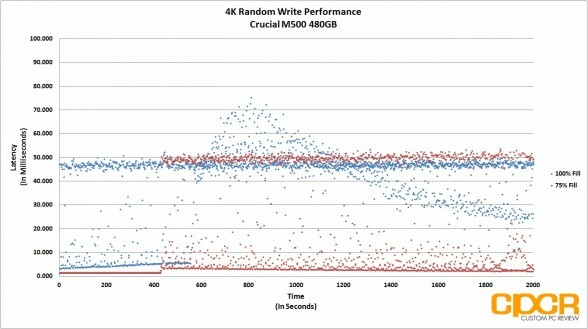 However, given that SanDisk is using the same exact NAND being used on their enthusiast SSDs today, and NAND is the most expensive component of any SSD, there’s no reason why there would be any significant difference in cost between a SATA based SSD and a M.2 based PCIe SSD using the same NAND. 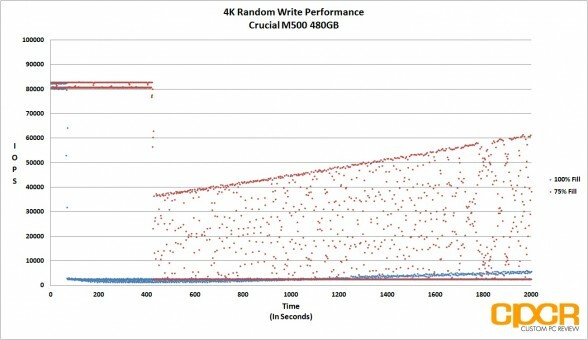 Despite the fact that the SanDisk A110 isn’t available for the general market, it’s definitely been nice to preview the SSD to know that M.2 PCIe is ready for price time. 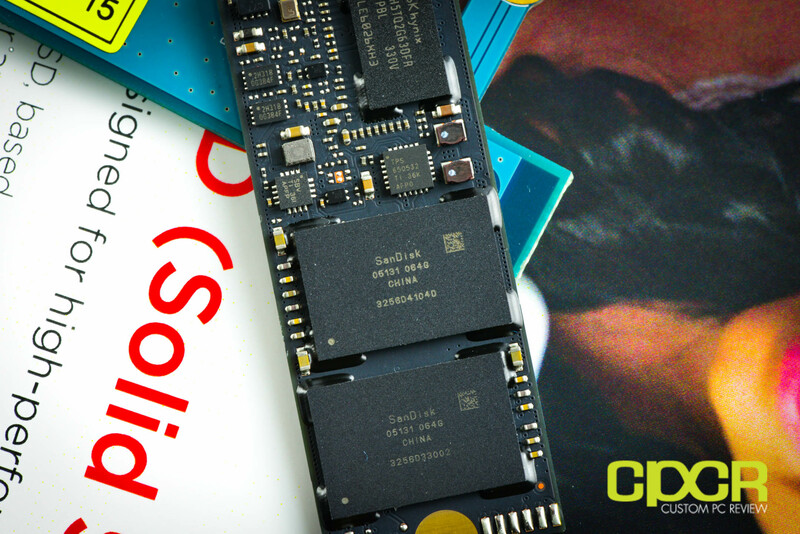 While we won’t be awarding the A110 as it’s designed only for OEMs, it’s definitely something that needs to be considered by every system integrator. Implementation doesn’t require any significant changes in software and you’re looking at the potential for up to 770MB/s into a system as thin and light as an Ultrabook. 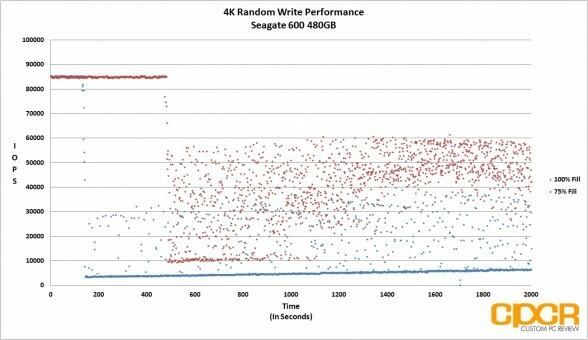 Say hello to the future. I have this sandisk a110, i used an M.2 to USB 3.0 adapter unfortunately my desktop pc on windows 8.1 recognize it as an ” ASMT 2105 “, should I use an PCI x 4 adapter ?